It doesn’t matter whether you’re new to Oracle Retail, have an active implementation project that is running or have an existing deployment in production. The same issue applies: You are making a significant investment in the technology and need to develop a reliable and efficient batch schedule. If you’re new to Oracle Retail, you are no doubt embarking on a major project to improve your competitive position in the retail market. With that in mind, your goals will be to shrink the time-to-market for your retail implementation, lower the reliability risks associated with in-house developed solutions and improve the visibility and control of retail business processes. 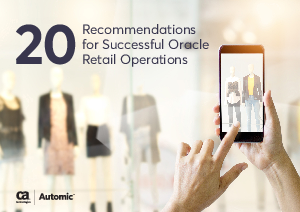 In this eBook, you will discover a series of recommendations for operating a fail-safe and efficient Oracle Retail operational environment. You will also understand how automation enables you to streamline the execution of your Oracle Retail batch operations and increase the day-to-day efficiency of your operations teams.